Decorating a dorm room is a staple part of college life, but many college students are working on a tight budget. As a result, many students might think that they need to resort to milk crates and grandma’s cast off the couch to make ends meet. But the truth is, there are plenty of ways to decorate a dorm room on a dime. 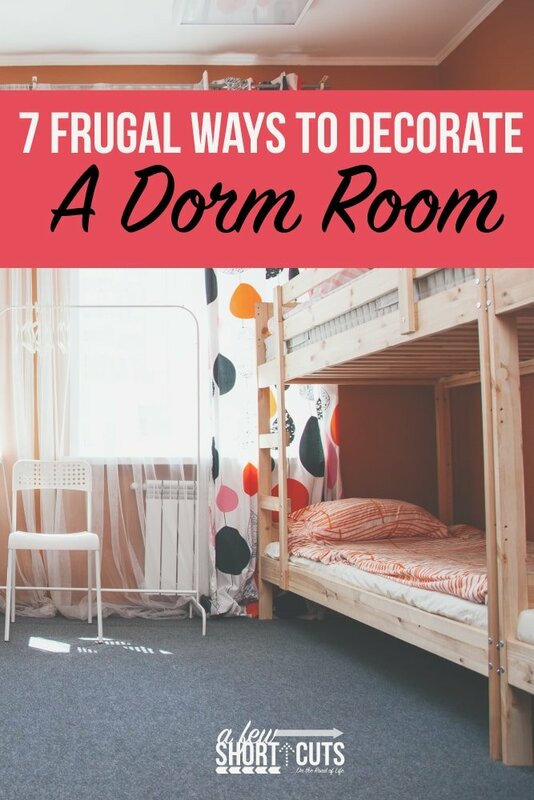 Take a peek below at 7 frugal ways to decorate a dorm room for less and still get it looking pretty and practical! 1. Let the internet be your friend. Check out Craigslist for free items that people are giving away as well as second-hand furniture items and home décor pieces. Always ask for pictures of the items and always choose a public place to meet and do the exchange. Should Craigslist not be your cup of tea, check the classifieds section of your local paper (available online) as well as online sale groups on Facebook. You will find all sorts of new and used furniture and décor that can do the trick. 2. Head to your local thrift store. Thrift stores are perfect for second-hand pictures, frames, furniture, linens, filing cabinets, baskets, and other dorm room essentials. Don’t forget to show your student ID so you can get any additional discounts that may be available. If you don’t find anything the first time you go, go back! Inventory is always changing. 3. Behold the power of spray paint. Spray paint can change the look of anything. Find second-hand picture frames, end table, chairs, and other décor pieces and give them a fresh coat of paint. Just a touch of paint can lighten and brighten any piece, as well as make it look cleaner and newer. 4. Learn simple re-upholstering tricks. If you find a chair you don’t care for, you can always cover it with new and more in fashion fabric. Find out how to remove a seat cover (typically it just requires removing a few screws underneath) and recover it with fresh fabric. A staple gun and about ½ a yard of fabric is usually enough to get the job done and make the chair look like new. Collect pine cones, assorted branches, or even flowers to decorate your dorm room with. You can spray paint the pine cones or branches to match your décor and arrange them in a vase or bowl for display. These items are free, so take advantage of them! 6. Color a wall without paint. Use a spray adhesive and some colorful fabric to cover a boring wall. Just spray, press the fabric, smooth it out, and you are done. Since paint isn’t typically allowed in dorm rooms, this is a great compromise! When you are ready to remove it, just mist it with water and pull. Wipe clean. If the fabric isn’t your thing, take a bunch of picture frames and spray them various colors. Remove the inserts and just display the frames in a collage. 7. Get creative with storage. An old cast off ladder is perfect for displaying books. Old crates can be used for storage or have a cushion added to them to make a stool. Baskets are decorative and also offer storage, as do large flower pots and vases. Buy items that do double duty, not only adding décor to space but storage too. Did you ever think that decorating a dorm room could be so budget friendly? Give these tips a try and decorate your dorm room for less!